Investors should take a close look at Honeywell International, Ingersoll-Rand, and Emerson Electric. This hasn't been a great year so far for the industrials sector, but that doesn't mean there aren't good buying opportunities out there. Indeed, Morgan Stanley analysts recently initiated five stocks with overweight ratings. Let's take a look at three of them -- Honeywell International (NYSE:HON), Ingersoll-Rand (NYSE:IR), and Emerson Electric (NYSE:EMR) -- and why you should consider buying them now. There's a lot to like about Honeywell International in 2018. In common with peers United Technologies and General Electric, Honeywell is benefiting from a strong aerospace market -- most notably from aftermarket sales and a recovery in business jet spending that is seemingly still in its early stages. However, the difference is that GE's other key segments -- notably power and renewable energy -- are floundering, and United Technologies's commercial businesses (Otis elevators, and climate, controls, and security) have disappointed so far this year. In contrast, Honeywell has ramped full-year organic sales growth guidance across its segments in 2018, and management hiked full-year earnings and free cash flow (FCF) guidance in the first two quarters. Looking at the longer term, Honeywell has secular growth opportunities coming from previous investments in so-called "breakthrough initiatives" like aircraft WiFi, warehouse automation, and industrial cybersecurity. 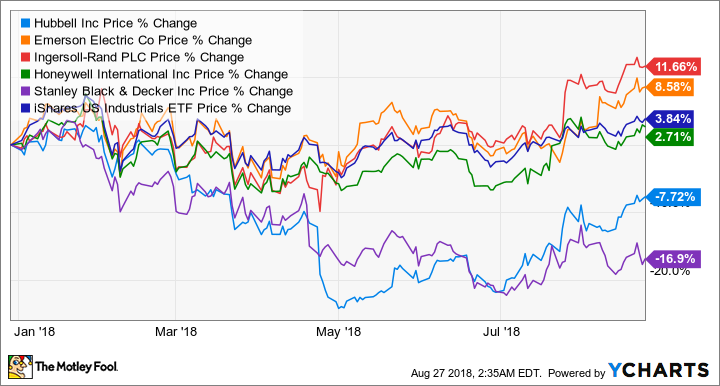 Based on management's guidance for FCF in the $5.6 billion to $6.2 billion ranges, the stock is trading at a forward price-to-FCF ratio of between 18.9 and 21. That's a good value for a company with double-digit percentage annual earnings growth prospects. Speaking of long-term growth prospects, Ingersoll-Rand (NYSE:IR) is well positioned to benefit from the rising demand for heating, ventilation, and air conditioning solutions in the many emerging markets where the middle class is expanding. Moreover, the strains imposed on electrical grids by air conditioning -- for example, around 70% of Saudi Arabia's electricity is used to power air conditioning systems -- will enhance the appeal of more efficient solution providers like Ingersoll-Rand's Trane. Throw in its compelling FCF-based valuation and long-term margin expansion opportunity, and Ingersoll-Rand looks like an attractive stock to buy now. Moreover, for those worried about the prospect of a cyclical slowdown in North America (where the company makes slightly more than two-thirds of its sales), it's worth noting that a third of Ingersoll-Rand's sales come from parts and services -- a relatively secure base of recurring revenue. It's not widely discussed, but the U.S. industrial economy fell into a recession for a brief period in 2015 and 2016, a downturn largely caused by falling energy prices and mining output, which in turn led to declines in heavy industries' capital spending. The knock-on effects were seen in areas like construction and process automation. That hit companies like Emerson Electric (NYSE:EMR) hard. Emerson is more focused on process automation, while Rockwell is more of a factory automation company, and it's telling that Emerson is now the one growing faster. In a nutshell, Emerson Electric has good earnings momentum in 2018, and buying its stock would give your portfolio good exposure to energy prices. Moreover, Emerson Electric is a Dividend Aristocrat, and therefore a favorite among income-seeking investors. CEO David Farr targets a payout equivalent to 40% to 50% of annual FCF, and given the improving earnings and FCF environment for the company, he raised expectations for the company's dividend in the coming years during this spring's investor conference. The company remains one of the go-to picks in the sector for investors who are worried that we might experience a late-cycle slowdown in non-heavy industries industrial markets. I happen to agree with Morgan Stanley that there's a strong case for buying Honeywell and Ingersoll-Rand -- at least, I hope there is, because I hold both stocks. They trade at attractive valuations and are favored by positive long-term end markets. They've also positioned themselves for growth -- Honeywell via its investments in technology, and Ingersoll-Rand through expansion in emerging markets. Emerson Electric is dividend-investor-friendly, and it's probably the best positioned large-cap industrial stock in 2018. It gives investors good exposure to the possibility of higher energy prices -- higher FCF for Emerson Electric usually means higher dividends for investors -- and it would work well in a balanced, income-seeking portfolio.